Meet Monika Edgar, a unique piece of the wonderful puzzle that is Historic Downtown Louisville. 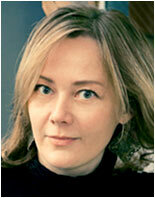 Monika grew up in Soviet era Lithuania, which must influence her amazing work. Come see Monika at the March 2 First Friday Art Walk at Creative Framing and Art Gallery. The beautiful photo was taken by another talented Louisville artist, Dona Laurita. Meet stylish Lhasa Apso Maggie Mae. Maggie is, well, lets just say, "of a certain age," kind of like the Maggie Mae immortalized by Rod Stewart. 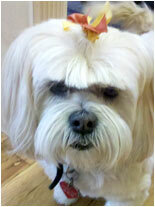 Maggie can often be found greeting customers at the equally stylish By Chance – located at 920 Main Street. Stop by and say hello! Foosball anyone? 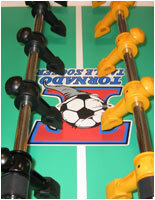 Sign up for our March Madness Foosball Tournament TODAY! Send us an email at Thelocoyo@gmail.com. We will be setting up divisions so let us know what you fit in: Novice; under 12; 13 – 16; 17 and up; Beckham's got Nothin' on Me. We are working on sponsors and a prize list... yes, a prize list! Stay tuned and sign up early! See you on Front St. This sizzling gallery is kicking off their 2012 schedule with four fabulous artists: master sculptor, Alexei Kazantsev, master painter, Rebecca Tolle, the whimsical illustrator/painter, Mona Simon, and our revolutionary artist-in-residence, Monika Edgar. Bring a friend, meet the artists, and indulge in savory appetizers and libations while you enjoy live music and lively conversation! This unique corner gallery features the work of more than 40 artists. 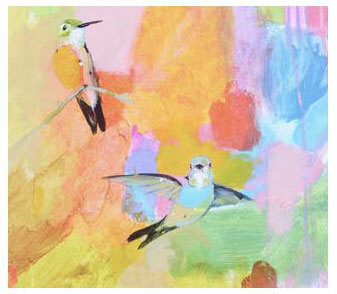 Join us Friday for a reception for nationally acclaimed pastel artist Colleen Hoerner. Acoustic music by Louisville’s own Joan Huntsberry and Andy Langford. 303-862-6866. We're lucky to have Tony creating in Louisville. You can also see his work in Louisville wannabes like Aspen and Cherry Creek. (: Meet Anthony and see his new work – like the beautiful piece at the top of this page. Is Boulder County's greatest barista also an artist? Yes she is. Jennifer Hirshhorn, Julie Barbera, Jennifer Blanchard. Spring! A great time to get out of the house and into the warmth of supporting local artisans while shopping for yourself and gifts. We'll have lavender lemonade to keep you refreshed while you shop. A five course dining extravaganza featuring the creative culinary work of Chef Hosea, with optional wine pairings from the ultra-hip Denver urban winery, INFINITE MONKEY THEOREM and winemaker, Ben Parsons. Chef Hosea will introduce each course along with his culinary point of view and inspirations. Ben will introduce each wine, while explaining his innovative approach to winemaking. View the menu and wine pairings on our website. In celebration of St. Patrick’s Day, be prepared with some festive dishes certain to tame your wild bunch! The infamous Irish Lamb Stew along with a miniature Sheppard’s Pie and Irish Soda Bread will kick off your evening. The Irish love their potatoes and especially their Colcannon. There’s nothing like ending the evening with a Guinness Stout Ice Cream Float along with Stout Chocolate Cake. You will swear you’re in Ireland! Cost is $20. Advanced registration is required. Whether it’s preparing ahead for the freezer or creatively “throwing together” a last minute meal, the tummy loves a tasty casserole like the King Ranch Chicken Casserole or the Ham and Leek Meat Pie. One-Dish Pinto Bean and Sweet Potato Chili is perfect for après-ski. Learn how to make Stuffed Polenta with Bolognese and how to create the perfect Potato Gratin to add to any meal. Don’t forget the dessert – Sticky Toffee Pudding with Bourbon Whipped Cream. Cost is $20. Advanced registration is required. Sean Moynihan, who has written about Louisville’s Bachelor Club for The Louisville Historian, will talk about how Louisville residents found their mates. Bring your lunch as well as your own family stories about people found romance long ago and how they do so today. Join Kevin France, research associate from CU-Boulder’s Center for Astrophysics and Space Astronomy, as he describes the explosion of discovery of extrasolar planets, from the first planet discovered orbiting another star in 1995 to the 1,000-plus extrasolar planets known today. He will discuss the use of modern telescopes to determine size, composition, and temperature, and he will outline current extrasolar planet research and what we can hope to discover in the next decade about Earth-like planets around stars.